Abbie Huhndorf, local boy and son of Mr. and Mrs. A. E. Huhndorf now living at Gaston, Oregon, had his picture in one of Seattle’s papers this week announcing his graduation from the Bombardier’s School at Victorville, California. Yelm will soon be able to put a good sized force in the air with all of its own. Jack Gruber and John Vandermay are soon to be pilots, Abbie Huhndorf and Budd Carew are bombardiers and Bill Trotter is a navigator. Just a few more and we’ll have a squadron. Johnny Vandermay writes from Maxwell Field, Alabama that he is getting long fine towards his pilot’s wings. In tests held recently he received two 100s and a 90. He has completed his preliminary schooling and now will start on his next step. He seems to be hungry for apple and oranges. Hope he gets a bushel of each, they are good healthy food. Ed Prince in a recent letter to Mrs. Ina Fox says he is leaving soon for somewhere not designated. He is a gunner on the merchant marine, he reports. Jimmy Mosman writes from Seward this time. He says not to be alarmed if he is not hear from for six months. Orders is orders. Jack Mayhe writes a most enticing letter from Cairo. Says he spent an entire afternoon trying to get his ideas of food across to a native waiter. Spent the night eating all the good food the waiter brought in answer. We will publish his letter if we can. Sergeant Tex Chance, whose squad won first place in skiing when the 87th was training at Mt. Rainier has been instructing at Denver. He has been moved out to foreign soil. Your guess is as good as his about where the ski troops will go. Tex is well known to some Yelm folks. Ex-Sergeant Harry Poulson is now Lieutenant Harry Poulson according to word received here by Mrs. Colin Hastie from her daughter, Mrs. Poulson (Helen Hastie). Lt. Poulson after finishing his schooling at Ft. Benning, Georgia, has been ordered to Camp Rucker, Alabama, to join the 81st division. Mrs. Hastie called at the News Office to get the address of Master Sergeant and Mrs. David Lindenau who are also stationed at that camp. Jimmy Rice write that he has left Guadalcanal Island for the island of Tulagi. He also send the welcome news that he is beginning to receive mail and the best of all, to see home again very soon. Cy Stewart , formerly of Yelm, and a cousin of Sain Stewart and other Stewart boys, is now stationed in North Africa where he is a tail gunner in a bomber. Those who remember him ay they’d hate to be a German in Cy’s path when he is in a fighting mood. 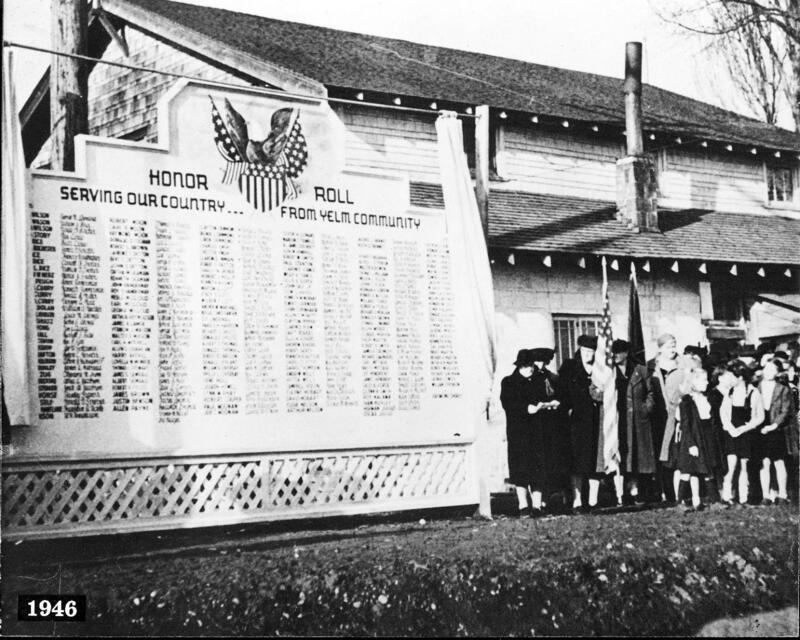 The Yelm Honor Roll listed men and women from the community serving in the military during the war.